Back Porch Memories • View topic - Deanna's July Challenge: It's Black & White! Deanna's July Challenge: It's Black & White! Post subject: Deanna's July Challenge: It's Black & White! I don't often print my photos in black and white but sometimes the colors in the photos don't really match the papers I want to use which in this case was the BackPorch Memories April Medley. I like the effect the b&w photo has. My challenge this month is to use 1 or more photos in black and white and I also want you to show a 'relationship'. My photo is of my youngest and oldest granddaughters sharing a treat. They always get along so well even though there's an 8 year difference in their ages. You have from now until midnight Eastern time on July 31 to complete the challenge. You may complete as many projects using the challenge as you wish. Each project will earn you an entry into our monthly prize drawing. Please upload your layout to our gallery in the appropriate "July '13 Challenges" folder to be eligible for the prize. Post subject: Re: Deanna's July Challenge: It's Black & White! great challenge and I love b&w photos! Great LO!! I like using black and white photos in layouts. Great LO, too. the photo works perfectly with these papers! A beautiful layout and a great challenge! Cute layout! 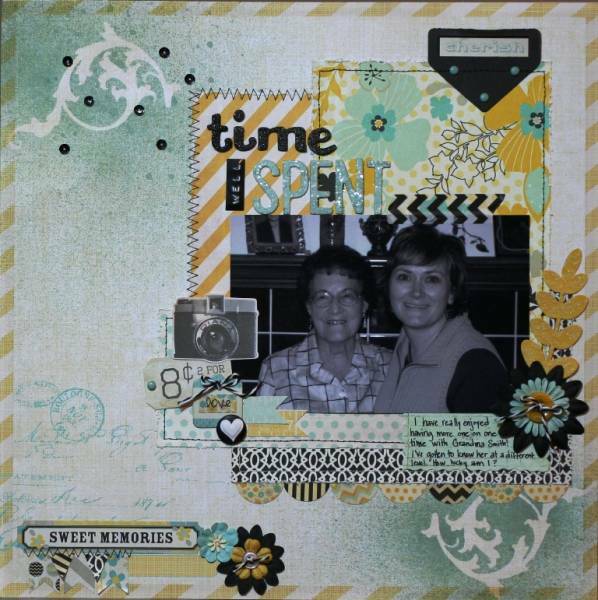 I love the papers you used and your design is fabulous! Hopefully I can get to this challenge soon. I finally got to this challenge. It's funny I didn't realize that I used the same paper you did Deanna. I was just so excited to use it and with a black and white photo it worked great. This is a photo of me and my grandma a few years ago. Thanks for a great challenge Deanna! Beautiful page with all the misting and making! Totally different look with the same papers! Thanks for taking my challenge! Great Challenge Deanna! LOVE the layouts!